Crossover center console boats for fresh and saltwater—fishing and pleasure boating are gaining popularity in today’s boating marketplace. That is why NauticStar Boats introduced the Legacy Series in 2015 with the 2102 Legacy. Now, NauticStar has launched the latest in this series: the 2302 Legacy. This new model incorporates all the popular features of the 2102 into a larger, more spacious package. Whether it is offshore fishing, inshore casting, or coastal cruising, the innovative and versatile 2302 Legacy offers an incredible boating experience. The 2302 Legacy offers an exceptional fishing platform and a boatload of features for both salt and freshwater fishing such as deluxe leaning post with rocket launcher rod holders on the backrest; dual insulated fish boxes with overboard drain; 6 horizontal gunnel rod holders and 4 stainless steel rod holders; aft baitwell with recirc and aerator pump and LED livewell light. In addition to fishability, the 2302 offers comfort and family-friendly amenities including a larger console with marine head and portside window; in-console cooler (can be an optional livewell) as well as a slide-out 94 quart Igloo® (or optional Yeti®) cooler in the leaning post; oversized bow seating with flip-out backrest, bow cushions and bolster pads for added comfort; 3-across integrated seating aft with walk-thru transom door; and Infinity stereo system with Bluetooth and 2 JBL speakers (4 speakers with t-top option). The 3-across seating features battery storage under the starboard seat, an insulated cooler in the middle, and cast net/bucket storage under the portside seat. High-pressure wash-down for easy cleaning, transom shower, stainless steel stepladder, and floor drains are also standard features. The 2302 Legacy will accommodate a wide range of options to customize it to fit fishing or pleasure boating preferences. It is well suited for a canvas or fiberglass T-top which can be aluminum or white or black powder coated. The console is large enough to be fitted with a Garmin® 7 or 12 inch touchscreen display with BlueChart® plus CHIRP DownVü. The bow table option with filler cushion converts to a sundeck or a casting platform. Other options include a removable ski tower, gravity flush porta potty, Yeti® cooler upgrade, and SeaDek® anti-fatigue helm mat. The 2302 Legacy produced some exciting performance data when tested by Yamaha Marine. Powered by a four stroke F200XB the Legacy planed in 3.78 seconds. It had a top speed of 46 MPH with a fuel burn of 5.0 MPG at cruise. It went from 0~30 in an impressive 6.61 seconds. The 2302 is 20’-3” LOA, with a beam of 102” and is rated for up to a 250 horsepower with Teleflex SeaStar Pro hydraulic steering and tilt. The fuel capacity is 96 gallons. Deadrise at the bow entry is 42°, 19° at the transom. The boat has a 10-person capacity. When you compare construction, performance and features, NauticStar is second to none. With more than 25 years of design engineering knowhow, they have a high commitment to quality. Each boat is water tested and must pass one of the boating industry’s most rigorous quality control test before leaving the plant. 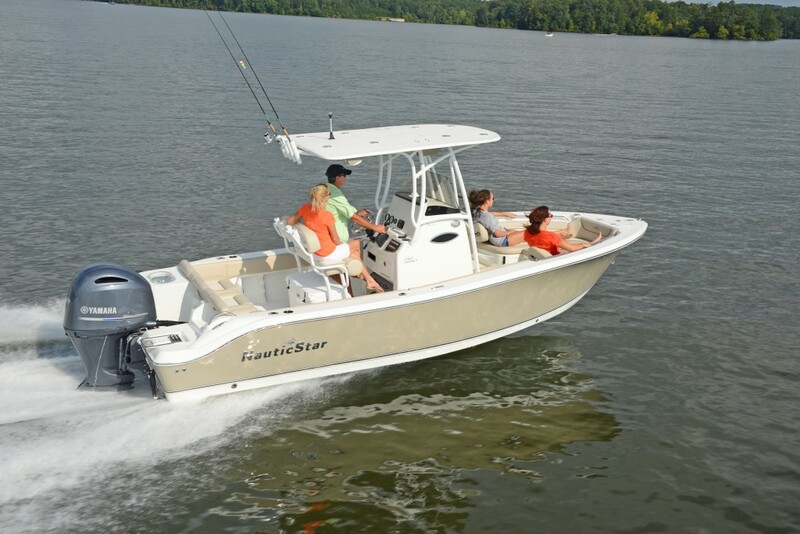 All NauticStar boats feature 100% wood-free composite construction; molded, one-piece foam filled fiberglass stringer system; fiberglass inner liner; and self-bailing cockpits. This allows NauticStar to offer a limited lifetime hull warranty.